The rise of content marketing has brought content creation to the forefront for all businesses. This makes it more important than ever to explore the best ways to create effective content. The definition of effective content for every business may be different, but in general, it still has to bring you closer to your goals. That’s why effective content has to resonate with your target readers. Earlier this summer, I gave a presentation entitled “15 ways to improve your content writing” at the Summit on Content Marketing. Here are the first eight of those tips. A structured writing process can help you save time and become more productive. As there’s an increasing need for content nowadays, it’s important to find the best process that can help you focus on content creation. For example, it might be helpful to dedicate a set block of time on your calendar for content writing, putting aside all distractions. If you start to get stuck, it may be a good idea to stay away from the copy for a while and either take a break or have someone else read it for a fresh perspective. It’s not always easy to come up with a new content idea, and this can sometimes require some creative brainstorming moments with other team members. Keeping a content calendar or notebook can help you organize all your ideas, ranked from best to worst – any of these can offer a new perspective on your content goals. If you’re still struggling for content ideas, take a look at our 21 quick ways to find inspiration for creating content to help you with your next great post. Although the widely-reported ‘fact’ that we now have an attention span of 8 seconds has been called into question, internet users are more discerning with their time than ever before. There is a huge abundance of content available online, and your content needs to be able to grab the user’s attention, and hold it, in order to succeed. In the digital world, there is any number of competing demands on the user’s attention. Our attention shifts from one task to another as we open new tabs or check multiple screens. Why should the user keep reading – or watching, or listening to – your content? You need to hook their attention and keep it there. One way to convince users to pay more attention to your content marketing is to mix up your formats. The last few years have seen an explosion in the types of content available to create and host online, with each one serving a different purpose. Images are the most popular type of visual content. They offer a powerful impact on a message and they certainly create a memorable experience. It is easier for the human brain to actually process an image and this increases the chances for your copy to be remembered. As 65% of people are visual learners, there is more chance your readers will notice your content if you pair it with the relevant images. Information graphics, or infographics, are graphic visual representations of information, data or knowledge intended to present information quickly and clearly. The use of graphics enhances our ability to see patterns and trends, which makes complex information more appealing and shareable. Readers tend to spend more time processing an infographic, compared with a written text, and that’s what makes them engaging, especially when they are added as part of a blog post. They’re also more shareable than other types of content. In fact, infographics are shared and liked three times more than any other visual content. This makes them a very useful addition to the promotion of your content, and it’s no surprise that marketers are using them more and more in their content marketing strategy. Video content has taken the lead as the most popular visual type of content over the last two years, a trend which has been boosted by social media. According to Cisco, videos will make up 80% of all internet traffic by 2019. This highlights how video content is going to become even more important. Even if we don’t use it as our primary form of content, it is still a powerful medium to support our message. Live video is another emerging trend, and it offers an immediacy that online users seem to enjoy quite a lot. Marketers and business owners have placed video among their top priorities for 2017 in an attempt to create more appealing and effective content. Remember, it’s not always necessary to hire a video producer to create short and entertaining videos that offer value to your audience. A GIF, which stands for Graphics Interchange Format, is a type of an animated image that was developed more than 30 years ago. It may not be new, but it’s a popular form of media with online users, as a quick way to share visual content that straddles the line between an image and a video. According to Giphy, there are currently around 150 million original GIFs out there online. They can be more powerful than an image, but they are also smaller in size than a video. Although GIFs are usually funny and informal, they can still fit with your content strategy, provided that you know how to use them in the right context of course. For example, how about using a GIF to explain a process in a “how-to” post? Or how about using a funny movie quote in an attempt to show your casual side while trying to show a more personal approach? What all of these types have in common is the creative way to present content, reaching people who like consuming content in different ways. For example, if you want to explain a complicated concept, you can use an infographic to make the process easier for your audience. 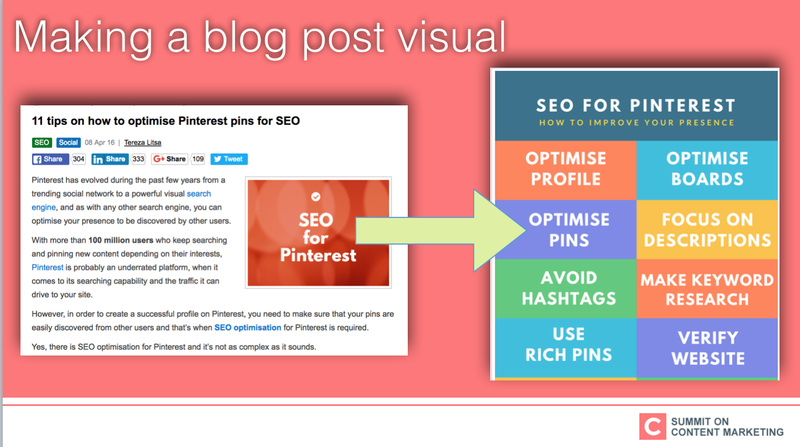 You can still create a blog post, and integrate the infographic with the rest of the written content. This increases the chances for your audience to stay engaged and enjoy what you have to offer. Content marketers often wonder whether long-form content is dead in the era of ‘bite-sized’ content. It may seem logical to assume that readers prefer shorter content, but this isn’t always the case. According to Orbit Media Studios, blog content is actually getting longer year by year. In 2016 the average blog post length was 1054 words – up from 887 words in 2015. This means that readers still value long-form content – provided that it’s interesting of course. Of course, length alone won’t guarantee the success of your content. However, the length of your content can indicate the depth of the topic you’re covering. If the goal of your copy is to increase awareness, build trust and offer value, then the length may be a key part of your success. You just need to find a balance between quantity and quality. Your readers will appreciate a piece of content that is clear and organized. There’s no need to suffocate your writing with big chunks of sentences. Another point to consider is how people consume content through different devices. Not everyone accesses your content through the same screen, which means that your content has to be optimized for all devices. This includes its layout. What seems like a small paragraph on a desktop may turn out to be a really big paragraph on a mobile device. And that’s a good reason to test your content on all devices before you publish it. Moreover, you can organize your thoughts using bullet points, which has the dual benefit of being direct and practical, while also being more clearly readable, helping readers to focus on the most important aspects of your message. 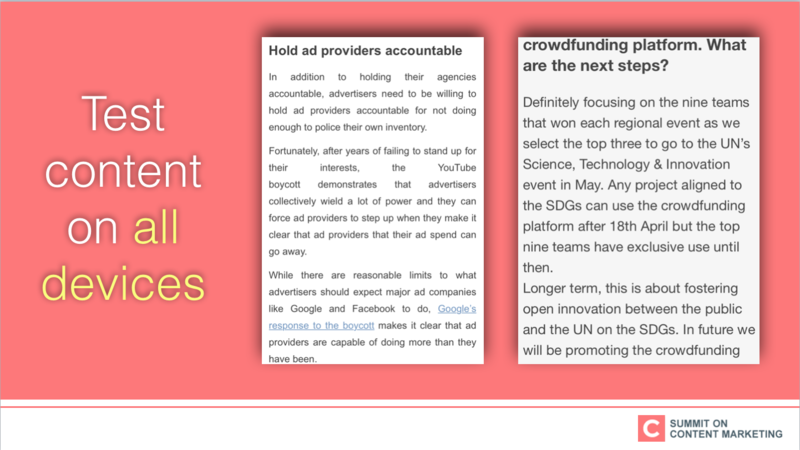 Bullet points can be useful at the end of a piece of text as an overview of what you’ve covered. This is a quick way to allow readers to get back to the things they need to remember from what they’ve just read. Beware, though – too many bullet points can produce the exact opposite result. How does formatting differ from structure? This has to do more with the way you present your actual content, rather than the way you organize the sentences. However, they are both important in their own way, with the ultimate goal being to convince readers to spend more time on your content. For example, if you want to make your content more appealing, then you need to add images throughout the text. It’s usually suggested we add the images in a way that they separate the longer paragraphs. If you want to make a point through a series of paragraphs, then break those up with an image that supplements your content, giving the readers’ eyes a break. When it comes to formatting, one of the most important tips is to pay attention to headings. Headings allow you to divide your content into logical sections, each one headed up by a catchy title. Spend a decent amount of time thinking up each heading – and don’t be afraid to use plenty of them. 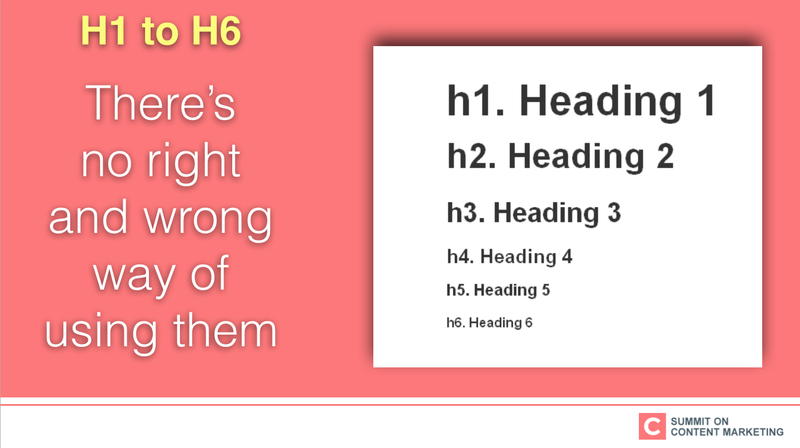 Ranging in terms of importance (and font size), headings span from H1 to H6. You can use a range of different header sizes if you want to label certain sections of your content with subheadings, or you can stick with just a couple throughout. It’s also useful to keep in mind that headings contribute to SEO and the way search engines discover your content. As crawlers, the magic bots that search for content, access your writing, headings make your content structure easier to parse, and help to highlight the important bits. Thus, if your headings are relevant and interesting, you’re also going to help your content rank well in search. Before you dive into content writing, it’s useful to set a goal of what you want to achieve with your content. There are many ways to use your content. Not every post should serve the same goal and in fact, it’s useful to have a variety of content with different purposes. For example, your latest post can promote your new product, but it’s probably not a good idea to do that with a series of ten posts in a row. Readers don’t like overt promotion via content, but you can still create valuable content that happens to also be promotional. Just ensure that your content serves a genuine purpose beyond promoting whatever you want to draw attention to. Ask yourself: What would I, as the reader, be able to learn from this? While setting a goal for your content, make sure you’re not turning your content into an automatic machine of business jargon. It’s easy to fall into the trap of thinking of the outcome more than the actual process before it. If you’re only thinking of the goal and not the copy, then you risk losing your unique brand voice and your readers along with it. Set a goal, then start writing, leave the goal aside and focus on your content. Once your post is published and you’re tracking metrics, you can return to the initial goal and see whether you’ve come close to achieving it.